Photograph, Picture of The Deuce is Wilde in front of the Catacombs. Image available on the Internet and included in accordance with Title 17 U.S.C. Section 107. CATACOMBS. The Catacombs was one of Houston’s most important rock-and-roll clubs of the late 1960s and early 1970s. It opened in April 1966 at 3003 South Post Oak Road in Houston’s west side to provide entertainment for teenagers between the ages of fifteen and twenty. The club was owned by Ames Productions, which was owned by brothers Richard and Steve Ames, and Bob Cope served as the general manager. Bands popular at the time, such as Houston’s own Neal Ford & the Fanatics, Dallas-based band The Five Americans, The McCoys, The Cyrkle, B. B. King, Jethro Tull, the Shadows of Knight, Ten Years After, and the Grateful Dead regularly performed at the Catacombs. Local Texas garage bands often played as openers for the national acts. 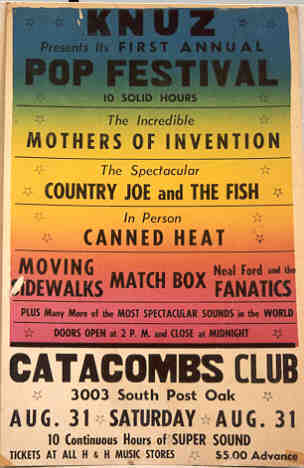 In August 1968 the Catacombs hosted Houston’s first pop festival at which Country Joe & the Fish, Canned Heat, Mothers of Invention, among others (including local group the Moving Sidewalks) performed. The club consisted of two large divided rooms with a main stage and a second stage. The second stage at the club served to showcase local new talent, and the Catacombs held auditions on Saturdays for local bands. Poster advertising for the Catacombs Club. Image available on the Internet and included in accordance with Title 17 U.S.C. Section 107. With the opportunity in the late 1960s to buy a larger building, by early 1969 the owners moved the club to the corner of University and Kirby streets in Houston. Unlike the intimate feel of the original location, the new venue consisted of two levels with balconies overlooking the main floor and had multiple spaces for a variety of uses. This high-tech setup came equipped with a superb sound system and stage and a movie projector for showing cartoons. The Catacombs played an important, albeit short, role in Houston’s rock-and-roll music scene. In 1970 the Catacombs closed. The club was reborn the same year as a community-run music venue called Of Our Own, but it closed within two years. “1960s Texas Music—Stephen Hammond Interview: the Catacombs, Of Our Own, Houston Rock Clubs in the late 60’s/early 70’s,” 1960’s Texas Music (http://www.scarletdukes.com/st/tmhou_hammondint.html), accessed October 7, 2015. Dennis Hickey, “The Catacombs: Houston’s Rock and Roll Nightclub” (http://www.faculty.missouristate.edu/d/DennisHickey/catacombshouston.htm), accessed September 30, 2008. Handbook of Texas Online, Heather Goodson, "CATACOMBS," accessed April 25, 2019, http://www.tshaonline.org/handbook/online/articles/xdc13. Uploaded on June 18, 2014. Modified on October 14, 2016. Published by the Texas State Historical Association.